For the past 55 years, the Nature Conservancy of Canada has been securing and managing properties in order to protect natural areas and maintain biodiversity. 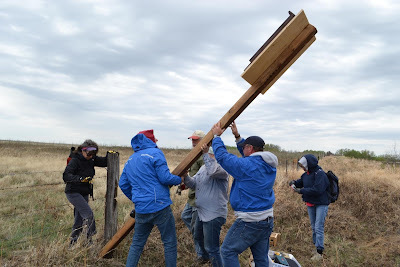 They secured their first property in Saskatchewan, the Qu’Appelle Coulee, in 1982 and now have approximately 68 properties and 206 conservation easements. Cameron Wood, Program Director for Central and Southeast Saskatchewan, outlined the steps the Nature Conservancy takes to identify, plan, and execute protection for the best of Canada’s natural habitats and species. Identify need by evaluating opportunities and threats. A Conservation Blueprint for Canada’s Prairies and Parklands, published in 2007, covers parts of 3 provinces and 2 states and is intended to “identify and map conservation targets, map existing protected areas and conservation lands, analyze the current protection of particular target species and ecosystems, and identify the best areas required to meet shortfalls in achieving conservation goals set for those targets.” Cameron explains that the NCC is looking for areas of relatively high concentrations of biodiversity while taking into consideration the factors threatening this biodiversity to determine where their activities can be most effective. Take action. Once NCC has mapped conservation targets on a large scale, they proceed to break it down by ecoregion. They are now ready to consider obtaining properties. Landowners with a deep connection to their land who want to ensure that it will be protected after they are gone may approach the Nature Conservancy to see if it would be interested in purchasing the land. The NCC then looks to see if there is a match between opportunity and biodiversity potential. They refer back to their regional reports identifying biodiversity hotspots and undertake a combination of desktop review and walk around/discussion with the property owner to see if the data is correct and the property would be a valuable addition to the NCC’s natural areas conservation program. If it’s decided that the property will be a good fit, the land is either purchased or donated. Purchases are supported by corporate and private donors as well as federal (Natural Areas Conservation Plan) and provincial (Fish & Wildlife Development Fund) funding. In some cases the land is donated; however, there are still costs as the NCC contributes to a stewardship endowment fund to support long-term land management expenses. Conservation easement. Landowners can also choose to keep their land in private ownership but set limits on how it can be used. A conservation easement is a legal agreement registered to the land title in perpetuity that restricts certain activities, such as draining wetlands or farming on native prairie. One of the Nature Conservancy’s most recent provincial acquisitions is 160 acres of rolling stabilized sand dunes near Dundurn. Sand dunes of this sort are rare in Saskatchewan, particularly on private land. 53 acres are covered by hardwood forest, 13 acres by shrubs and wet meadows, and the remaining acres are native prairie. The property is potentially home to a number of rare species, including the Hairy Prairie-clover and Gibson’s Big Sand Tiger Beetle, and provides excellent habitat for deer, moose, and elk. The property is adjacent to the Dundurn military base, also native habitat, thereby extending the property’s reach and biodiversity value. Once a property has been purchased, NCC staff carry out a close inspection, compiling a baseline inventory of all the species found on the property as well as the species they expected to find but didn’t. They invite volunteers, whose expertise and time are a valuable addition to staff resources, to participate in a bioblitz (June 2 at Dundurn, June 22 at Pasqua Lake). The inventory sets the stage for the property management plan. Protecting the site from outside interference isn’t always enough. Disturbance (cattle grazing or prescribed burns) also plays an important role in trying to match the natural balance. The Gibson’s Beetle, for example, requires a mix of open exposed sand as well as vegetated areas. Another priority is managing invasive species – whether it’s weeds, wild boar, or insects that have moved in from another habitat. 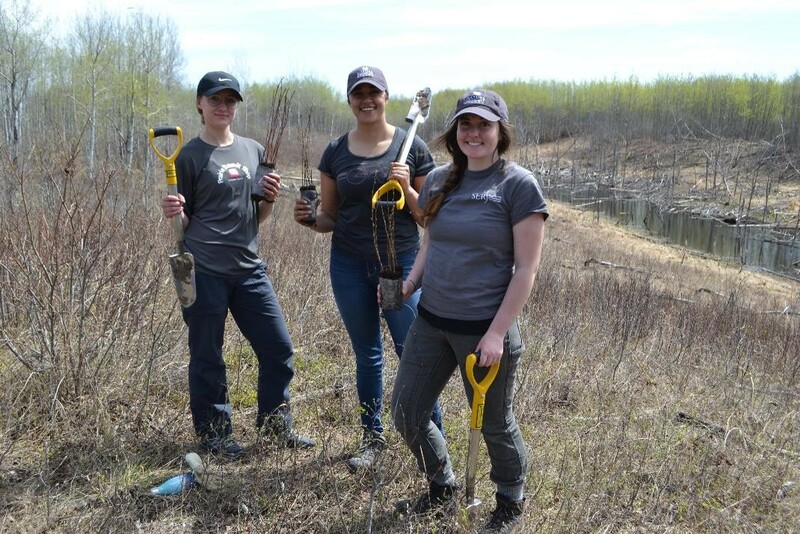 Volunteers are a valuable part of NCC’s activities and play an active role in land conservation. As a non-profit, the Nature Conservancy of Canada doesn’t have the staff to complete all the actions outlined in the management plan. They rely on volunteers, working alongside staff, to protect and maintain NCC properties through a wide variety of activities – from removing shoreline debris and old fencing to pulling up burdock or installing nest platforms. Anyone can volunteer, including families, students, and landowners. Some people return year after year. Carpooling to the day-long events is usually an option and you don’t have to be an expert to participate. One or two events are planned in each eco region every summer. Humans are part of the natural ecosystem and the NCC recognizes the importance of people visiting their sites to develop a love of nature and an appreciation for the NCC’s conservation activities. The properties are intended to remain wild areas. Most of the sites don’t have paths or other recreational facilities, but the public are welcome to wander over the properties on foot (permission for larger groups to visit the Dundurn property may be required due to its proximity to the military base).